Are you looking for an ultra easy and painless way to remove unwanted facial hair and body / bikini hair? Hangsun Hair Removal F130 has 3 different attachments-Facial Epilator, Eyebrow Trimmer, Precision Shaver, can be used to trim hair completely from face, neck, arms, legs, bikini line and other body area. All of your needs for skin care will be satisfied. 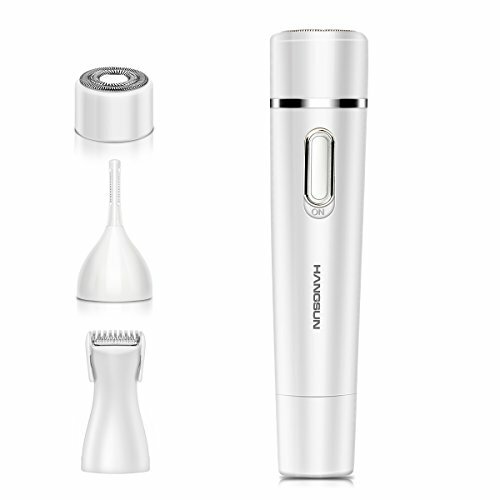 Enjoy a close, comfortable shave with this advanced women shaver. The shaving heads feature precision trimmers that stay sharp and extremely durable which makes hair removal with no pain. It can adjust all the contours and curves of the female body, with no irritation. Hair and other debris may pile up inside the device, so should be cleaned regularly (3-4 times' use). Follow the anti-clockwise to unscrew the head, then using the brush in package to wipe debris out. It's ok to wash the head with water but not the body. Pain-Free Hair Removal - Removes facial hair instantly and painlessly from lip, chin, cheeks. Eliminate peach fuzz on your face for a smoother application of foundation and powder. Say Bye to Old Eyebrow Razors - 2 snap-on eyebrow shaper combs are included to easily and expertly trim eyebrows to your perfect length and style. Show Off Your Bikini - The horizontal precision shaver head helps you achieve precise styling for bikini and sideburns hair removal, suitable for sensitive parts or soft hair. Trim your bikini line by placing the device on your skin and moving in the opposite direction of hair growth. Full Mark Reliability - The blades designed with anti-allergic material are not direct contact with skin. No more redness and irritation. There is a cleaning brush supplied with the device to clean the blades. 3 head also can be rinsed in water for cleaning, then wiped dry. If you have any questions about this product by Hangsun, contact us by completing and submitting the form below. If you are looking for a specif part number, please include it with your message.